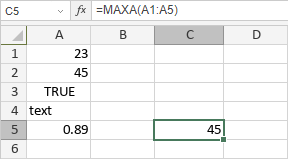 The MAXA function is one of the statistical functions. It is used to analyze the range of data and find the largest value. where number1(2) is a data (number, text, logical value) entered manually or included into the cell you make reference to.